Make London your December holiday trip. The city is always bustling but during the holiday season stores go all out with spectacular windows, sparkling lights that line buildings and crisscross streets and music everywhere. Pack comfortable shoes, warm scarf, hat and fly off to Heathrow (great shopping airport for last minute gifts before flying back). Take the Heathrow –London Express for the fastest way in (reserve ahead) or the Underground (Tube) or taxi to your hotel after checking options at Heathrow transport. 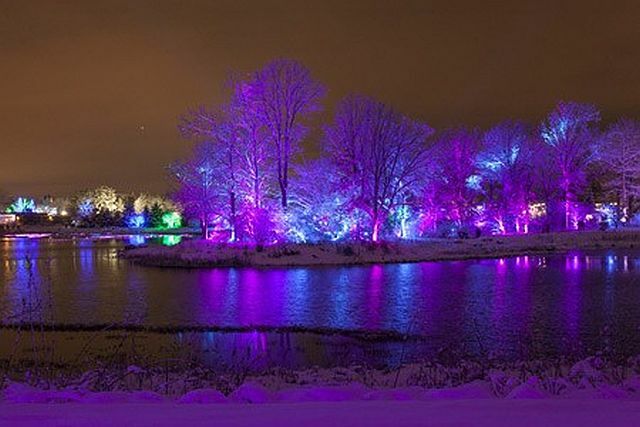 You are likely to find a place near where you want to be within your budget at Visit London. I like Marriott Hotel Marble Arch because it feels like a boutique hotel but is on a main tube stop and within easy walking distance to gaily decorated Oxford Street’s shops. Once unpacked and ready to go, forget taxis. Traffic is so bad above ground that the meter runs while you wait through three lights to proceed through one intersection. Pick up a map of the Underground stations but wear those walking shoes. 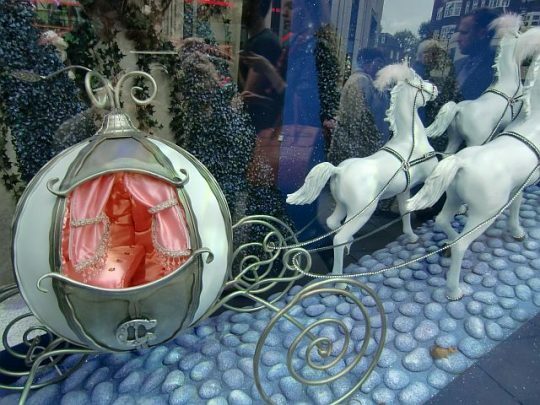 Holiday windows in the Knightsbridge Sloan shopping area often tell stories such as Cinderella a few years ago. Knightsbridge: Take the Tube, get off to shop the Knightsbridgbe-Brompton Road-Sloane Street District where you can wander Harrods. I like the Food Hall. Then, go into Harvey Nichols and Sloan’s other high-end designers, even if just to look. Snap photos of the Harvey Nichols Christmas windows (like Macy’s windows). They often tell a story like Cinderella. Tip: At Harrods and other London department stores you’ll see fun “crackers” which are good stocking-stuffers but airports started disallowing them after 9-11 so get one just for yourself to pop in your hotel room. King’s Road: Another Underground stop would be Sloan Square for King’s Road and the Chelsea neighborhood filled with designer and trendy shops and Duke of York Square. Browse fun boutiques, cafés and the Chelsea Antiques Market. 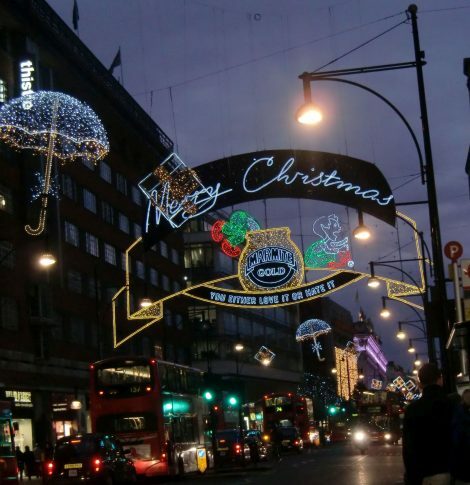 Oxford Street: You’ll love the lights overhead if shopping at night and the windows any time of day. They all definitely set the holiday mood for stopping at Selfridges and Marks & Spencer. If you didn’t get chocolates at Harrods, look for a Thorton’s across from the department stores. It’s a chain with really good candy. You can also find the Debenhams Department Store (founded in London in the 18th century) and several good clothing shops on the street. Which Tube stop that accesses Oxford Street depends on what stores you want to visit. The Bond Street station is closest to Selfridges. Regent Street: Famous for its holiday lights and shops the street maintains a retreat area where you can relax during the holiday season. If you don’t mind walking, you can use the Piccadilly Circus Tube stop to pop into Fortnum & Mason and go over to Hamleys, an amazing toy store to visit even if you don’t have to buy a kid’s present. Dating to 1760, Hamleys is among the world’s largest toy stores. There is also Liberty, a high-end store in an elegant Tudor building that offers cutting-edge and clever accessories. Oxford Street during the holidays (photo take a few years ago). Or use the Oxford Circus station to hit Liberty and Hamley on Regent and then Fortnum & Mason at Piccadilly. Opened in 1707 Fortnum & Mason has served the Royals since Queen Charlotte. You have to go here for the old atmosphere and to pick up something to take home. While in the area of Piccadilly Circus or Bond Street walk down Savile Row if interested in a hand-tailored suit. Among shops to visit there are Abercrombie & Fitch’s flagship store, Henry Poole & company and Gieves & Hawkes. Also, go to the boutique filled Carnaby Street. Covent Garden: You’ll find three unique markets here. Look for arts and crafts in the North Hall’s Apple Market. The East Colonnade Market has jewelry and handmade soap. Products in the Jubilee Market in the South Piazza vary by day from antiques on Monday to general items other weekdays and crafts on the weekend. You don’t have to load up the suitcase because the stores are happy to ship. But a good idea if you want to take presents back is to bring an extra bag. Remember airports don’t like wrapped boxes so plan to gift wrap at home. 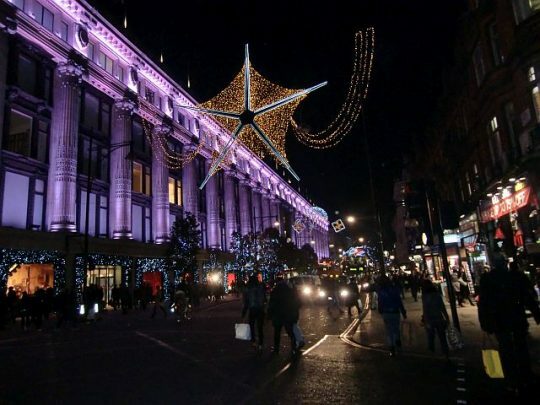 Have fun shopping, browsing and seeing London during the holidays. Either come to Chicago, to celebrate St. Patrick’s Day, the town rated tops n the country for wearin’ the green, or if already in town find out about all the events because they are likely to be happening where you are or want to be. Don’t’ worry that you missed such neighborhood parades as the Southside one that take place the Saturday before March 17. 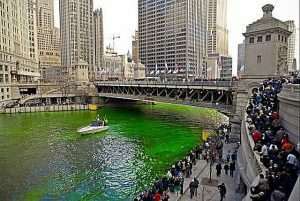 They’re fun but a lot more happens March 17 including turning the Chicago River green followed by the big, downtown parade. Of course there are also pub crawls. a run, and two days of music and dance at the Irish American Heritage Center. Just bring something green to wear. 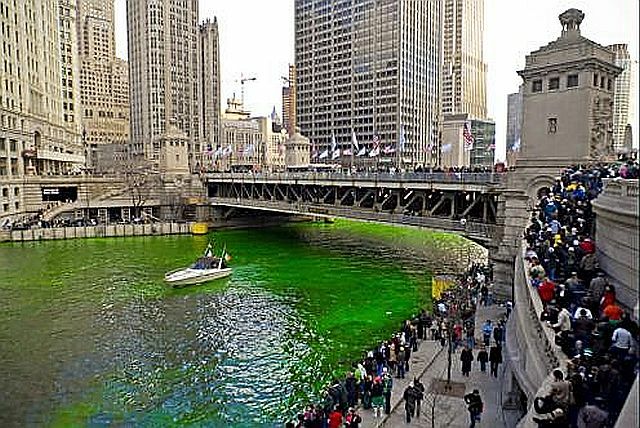 Join the crowd at 9 a.m., March 17, 2018 on Wacker Drive (upper or lower) or on the east side of the Michigan Avenue Bridge to watch the river turn green with an eco-friendly substance poured from the boat that you’ll see going by. Best plan is to get there early. After seeing the river, find a spot on Columbus Drive west of Michigan Avenue between Balbo on the south and Randolph Street on the north before the noon step-off time. Sponsored by Chicago Plumbers Local 130 UA and the Chicago St. Patrick’s Day Parade committee, the city’s downtown parade always has politicians marching but there are also several Irish dance groups and Irish bands. For more information visit City of Chicago/Parade and ChicagoStPatricksDayParade. IAHC’s festival is a two day event of Irish dance, singers and music. This year it actually falls April 17-18, but sometimes it is held the Saturday before St. Patrick’s Day if March 17 is not on a weekend. 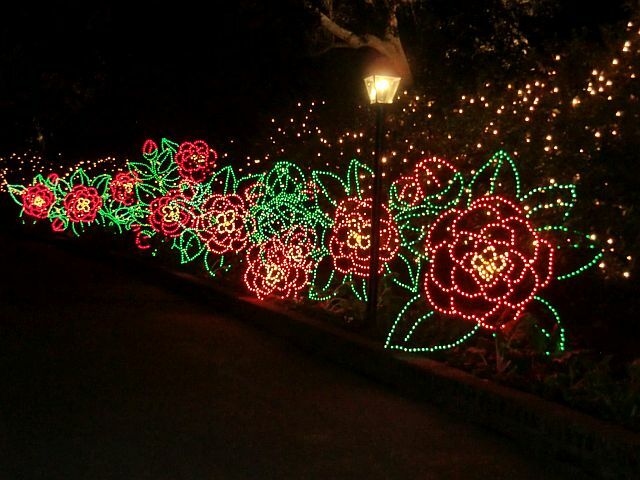 Typically drawing about 10,000 visitors after the parade and the following day, it goes from 1 p.m. to midnight. There’s also a crafts’ fair, Irish gifts and food and drinks available to purchase. Admission tickets are $15 or $12 if purchased before March 16. Youngsters age 12 and under admitted free. IAHC is at 4526 N. Knox Ave. Chicago. For tickets and more information visit Irish American Festival. Certainly there is a lot of drinking and also some eating. So a good way to work off the weight ahead of time is to participate in a 5 or 8 K run or walk in the Lincoln Park neighborhood just north of the downtown. Once known as the Leprechaun Leap, the event runs from 9:30 a.m. to 12:30 p.m. March 17 from near the Peggy Notebaert Nature Museum. Participants enthusiastically put together their green attire but they also get a commemorative shirt, and an invite to the post party at Select Steak House (2808 N. Halsted St. north of the Finish Line. For registration and other information visit Paddy’s Day run. Do the Wrigleyville bars from 8 a.m. to 2 p.m. March 17. Participants can pick up their tees and other paraphernalia ahead of time. Registration and other info visit Chicago Shamrock Crawl. There are two cruises that leave from Navy Pier. The Irish-themed Architecture River Tour begins in the morning at 10:45 a.m. and lasts 75 minutes. For tickets and more information visit Shoreline Sightseeing. There is also the St. Patrick’s Day Dinner Cruise which is a St. Paddy’s Day party on the Mystic Blue. It boards at 6:30 p.m. goes from 7 to 10 p.m. For reservations and information visit Mystic Blue Cruises. The only problem with celebrating the day in Chicago is the abundance of good choices. Say Memorial Day to some folks and the response is it’s the time to commemorate people who died while in military service. To others it signifies the beginning of summer vacation. On some town’s websites are parades, ceremonies and even a history note explaining that Memorial Day was originally Decoration Day and started shortly after the Civil War. On others, it begins the period from the end of May through Labor Day when beaches are open, lifeguards are on duty, several outdoor fests and tourist activities take place and bus routes are added. Five suggested Memorial Day Weekend activities in the Chicago area range from fireworks and festivals to a parade and party plus there’s a bus route bonus. The City of Chicago is holding a Wreath Laying ceremony in Daley Plaza at Dearborn and Washington Streets at 11 a.m. Saturday, May 27, 2017. It will be followed by a parade that starts at noon from nearby State and Lake Streets and travels south on State to Van Buren Street. The Grand Marshal is Marine Corps Commanding General Robert S. Walsh. The parade, among the country’s largest, includes veterans’ groups, marching bands and antique military vehicles. Visit Chicago for more info. The national Memorial Day remembrance is 3 p.m. Monday, May 29, 2017. For an excellent government-based web-site with history and other info visit Government. Chicago House Party – DJs and performers take over Millennium Park,’s Jay Pritzker Pavilion and North Chase Promenade Tent May 27, 2017, from 2 to 9 p.m. Expect a variety of “house music” a style started in Chicago that is danced to throughout the country. The grassy areas are good for picnics or dancing. For performer schedules check City of Chicago. Millennium Park is at Randolph through Monroe Parkways along Michigan Avenue. 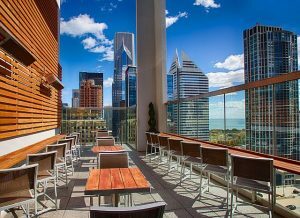 ROOF on theWit, a fun space with great cocktails and views of the city is starting its JETSET s series May 26-27, 2017. The party transports guests to Barcelona, Spain minus the airline hassle. ROOF on theWit is 27 stories above the Wit Hotel at 201 N. State St. at Lake Street, Chicago. For reservations visit Roof. JetSet weekends start at 2pm. For more information and reservations, visit Roof or call (312) 239-9502. The Belmont-Sheffield Music Fest runs from noon to 10 p.m. May 27 and May 28, 2017. A street party that has been going on for more than 20 years, the fest attracts excellent bands, good food, beer and wine booths and also features arts and crafts. A $5 entry donation benefits the Lakeview East Chamber of Commerce. Entry is at 3200 N. Sheffield, Chicago. 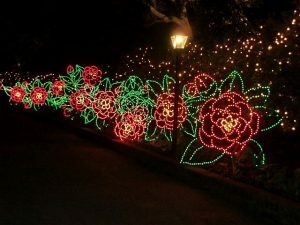 Vist Chicago Events for more information. 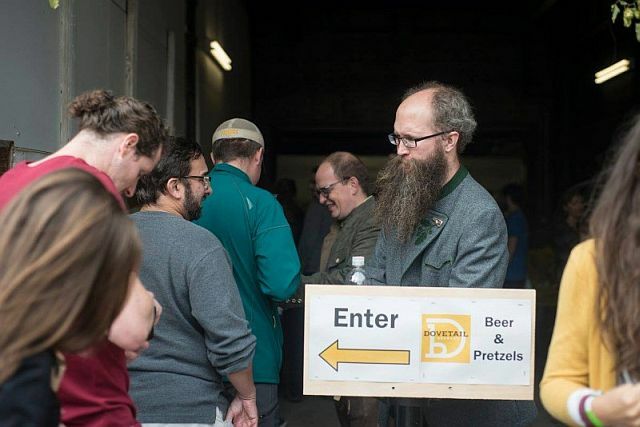 Dovetail owners Hagen Dost and Bill Wesselink welcome visitors to their brewery. Celebrate “Mayfestiversary,” a block party at and around Dovetail Brewery, 1800 W. Belle Plaine Rd. Dovetail is celebrating its first anniversary with Begyle Brewing which is marking the second anniversary of its taproom. There will be food trucks, live music and games. B elle Plaine Avenue will be closed from Ravensood to the CTA line. Part of proceeds benefit Foundations of Music.The festival goes from 11 a.m. to 10 p.m. May 27 and 28, 2017. For more information visit at Dovetail or call (773) 683-1414. Navy Pier is always good for a holiday outing but the Chicago attraction restarts its summer fireworks display Saturday, May 27 at 10:15 p.m. Among the ways to celebrate the weekend is to cruise on the Spirit of Chicago or Odyssey or stop in at the Miller Lite Beer Garden to hear Hot Rocks do Rolling Stones tributes from 2 to 11:30 p.m. BTW the Rolling Stones Exhibitionism upstairs at Navy Pier is worth seeing. Navy Pier is at 600 E. Grand Ave. , Chicago, IL 800 )595-PIER (7437) For more information visit Navy Pier or call (800) 595-PIER (7437). The CTA’s No 10 Bus that goes to the Museum of Science and Industry starts again Memorial Day weekend. That means it will be easier to get there from downtown Chicago to see the terrific Robots exhibit.